The various constitutional processes of the Scottish Independence Referendum on 18 September 2014 have both deeply embedded trajectories in UK’s experience, as well as traces of new constitutional futures. Regardless of the outcome, the referendum will be of huge importance to the constitutional arrangements and culture of the United Kingdom. There will also be repercussions for other states, Spain most obviously, but also other plurinational states in Europe and beyond. In the event of a ‘Yes’ vote, they will be even more important for the new Scottish state and the continuing United Kingdom. This blogpost, to be published in two parts, will consider a subset of these issues, focussing on contextual features and the primary constitutional considerations (i.e. competence to hold the referendum, and electoral law matters) whilst the complementary post of Robert Lane addresses the ‘external’ issues and challenges, including those of EU membership and the shadow of international law. The ambition is to map the process that the United Kingdom, and Scotland within it, have embarked upon in a scholarly and non-partisan fashion. The short answer to this question is twofold and interdependent. Firstly, it has been the long held position of successive UK governments that if Scotland, or indeed any subpart of the UK, was to definitively indicate its preference to leave the Union by way of a unequivocal and lawful expression of popular will, the UK government would respect that desire. Secondly, the success of the independence-advocating Scottish National Party (SNP) in successive Scottish Parliament elections (convincingly in 2007, and overwhelmingly in 2011) has created the opportunity for the popular will of the Scottish people to be expressed on this question. That is however an incomplete answer and a more satisfactory account would have to address numerous other factors, a non-comprehensive list of which might include: the UK’s membership of the European Union; the declining hold of the UK’s doctrine of Parliamentary Sovereignty; examples of secession and secession-like episodes globally, most notably in Quebec; Thatcherism and its divisive nature in the north of England and Scotland especially; the quasi-federal ‘devolution project’ of Tony Blair’s first government (1997-2001); the role of varied individuals such Sir Neil MacCormick, John Smith, Alec Salmond, and Margaret Thatcher; and the Scottish Constitutional Convention (1989) which created a broad-based social democratic consensus against the continuation of the ‘unitary state’. Other considerations could readily be added, and each would be merely the upper stratum of a deep geology of competing economic, political, legal and social forces. Although under siege from various forces, the doctrine of Parliamentary Sovereignty remains a starting point for many constitutional discussions in the UK. For the purposes of the independence question it usefully explains the constitutional geography of the United Kingdom (a sovereign Parliament based in Westminster with the legal capacity to make or unmake any law), the relevant institutional arrangements (including the Scottish Parliament, created by an Act of the Westminster Parliament, the Scotland Act 1998) and the hierarchical relationship between the two Parliaments (as the creation of the omnicompetent Westminster Parliament, the Scottish Parliament is an institution of limited competence). For present purposes, the key issue is the limitedness of the competences of the Scottish Parliament, which are outlined in the Scotland Act. Section 29 of that Act defines the legislative competences of the Scottish Parliament in negative terms, with certain policy areas ‘reserved’ to Westminster, and so all other matters falling within the competence of Scottish Parliament. Reserved matters are listed in Schedule 5 of the Act and include defence, foreign affairs, ‘the Union’ and ‘the constitution’. These boundaries are enforced by a series of mechanisms – executive, parliamentary, and judicial – provided by the Scotland Act. The significance of this restriction in legal capacity is that on its face it channels the route to independence via Westminster, that is, no Scottish Parliament would be legally competent to legislate for independence, or even to hold a referendum on independence, as these would implicate both the Constitution and the Union. This matter came to a head in the aftermath of the SNP’s remarkable electoral victory in 2011. The Scottish Parliament is elected by the additional member proportional system (in which 73 seats are elected by the plurality system and 56 on a proportional basis). Designed in part to avoid one party rule and provide a wider range of party representation than conventionally permitted under the plurality electoral system, each Scottish Parliament election since its inception had generated a coalition or minority government. The stunning success of the SNP 2011 was its ability to garner such a share of the vote that it obtained a simple majority of the seats in the Scottish Parliament (65 out of 129). The reasons for the triumph – dissatisfaction with the Labour ‘establishment’, which was itself in turmoil; a response to the newly elected UK Conservative government; the demonstrable competence of the 2007-2011 minority SNP government; the charismatic leadership of Alec Salmond; effective grassroots campaigning – were various and although nationalistic desire was very firmly amongst them, it was far from the only one or even dominant. Indeed, long term polling evidence indicates that whilst support for the SNP has grown, support for independence has scarcely altered, and significant numbers of SNP voters are not supporters of independence itself. Nonetheless, possessing an absolute majority in Scottish Parliament, the SNP found itself in the unique position of possessing both the constitutional and moral entitlement to press for an independence referendum, as it had pledged to do in its election manifesto. A few words about the use of referendums in the UK may be apt. In comparison to other European or common law jurisdiction, the United Kingdom has had relatively little experience of direct democracy. This is in large part due to the hold that notions of the “matchless constitution” and in particular the ‘Westminster system’, has held over the British constitutional imagination. Whether the superiority of these arrangements was ever true, it was long ago agreed that the British constitutional approach lagged behind other advanced democracies. The non-use of direct democracy may be seen as a subset of the process of ossification. That said, referendums have been used sporadically in the UK and there are signs that they are becoming a fixture in our constitutional arrangements. In 1975 a referendum settled the question of Britain’s continuing membership of the EEC as then was, in the late 1970s and again in the late 1990s they were deployed to settle the issue of devolution to Scotland and Wales. More recently there have been referendums on devolution for English regions (2004), changes to the electoral system (2011) and extending the powers of the Welsh Assembly (2011). As well as the forthcoming Scottish Independence referendum, a further poll on UK’s continuing membership of the EU has been promised. In this as in so many other ways, UK constitutional law may be seen on a convergent path with the international mainstream. Having won the election of 2011 so decisively, a confident SNP moved quickly to kick-start the process leading to an independence referendum, and in turn ignited a constitutional controversy. Indeed, when the Scottish Government published its consultation paper, “Your Scotland, Your Referendum” in January 2012, claiming the Scottish Parliament was entitled to ask questions about independence in the form of a referendum, the UK Government argued that any Referendum Act of the Scottish Parliament would be unlawful. This related to the question of whether the Scottish Parliament was actually entitled, as a matter of law, to legislate for an independence referendum. The argument can be summarised as follows. Those arguing against the Scottish Parliament’s capacity to hold a referendum pointed to the Scotland Act’s delineation of its competences, and in particular to s.29(2)(b) which states that an Act of the Scottish Parliament is incompetent if it “relates to” a reserved matter. Additionally they argued, as the purpose of any Referendum Act, taking account of its effect in all the circumstances (s.29(3)), was to dissolve the Union, this too would be a ground for incompetence as the Union itself is a matter reserved to the UK Parliament. These three narratives (respectively, unitary, federalist and union) were not susceptible to ready resolution. Neither side was willing to give way publically and the risk remained that by doing so, one side or the other would be pushed into a political corner, the outcome of which might be undesirable. For example, there remained the possibility that the Scottish Parliament, with a clear SNP majority, would legislate for a referendum in the knowledge that they would be challenged in that act, a challenge that would very likely be resolved in the UK Supreme Court. That court would then find itself in the awkward position of being a United Kingdom institution deciding on whether the Scottish Parliament could legislate to give the Scottish people the opportunity to vote on their constitutional future. Quite apart from the geographical tensions inherent in such circumstances, there was also slightly unpalatable prospect of such matters being decided in courts, framed in juridical terms, beyond the scope of ordinary democratic processes. Accordingly, on 15 October 2012 a concordat was signed between the UK and Scottish governments, known as the Edinburgh Agreement. Along with its appended ‘memorandum of agreement’, the Agreement sought to settle the above controversies in the following form: the referendum should have a clear legal basis; it should be legislated by the Scottish Parliament; it should command the confidence of the two Parliaments and Governments, as well as the people of the UK and Scotland; it should provide a decisive expression of the people of Scotland and as such, the result should garner general respect; the conduct of the referendum and any subsequent negotiations should be undertaken in good faith. Of particular relevance to the discussion below on electoral law, the two Governments agreed that “the referendum rules should be based on PPERA”, and that the non-partisan Electoral Commission would consider the wording of the referendum question, and publish a statement as to the intelligibility of that question. Certain of these elements required legislative action on the part of the Westminster Parliament (in particular that the Scottish Parliament be enabled to legislate for an independence referendum) which was promptly forthcoming in the form of an Order in Council, issued under section 30 of the Scotland Act, permitting ad hoc extensions to the legislative competence of the Scottish Parliament. From a Spanish/Catalan perspective this may seem an extraordinary outcome, and certainly one different in almost every respect to the current stand off between Madrid and Catalonia. An ignorance of the details and history of that situation militates against this writer engaging in comparisons, but certain explanatory features may be identified from a UK/Scottish perspective. Firstly, the passage from the post-war Union state to the present day has been deliberative and incremental, building on careful constitutional foundations (such as the Scottish Constitutional Convention) and repeatedly finding democratic endorsement, whether in the form of the 1998 referendum in favour of a Scottish Parliament or the successive and decisive electoral mandates of the SNP. Further, whether in respect of Northern Ireland (with the so-called ‘Border Poll’ of 1973) or in a longer timeframe in the context of decolonisation, the United Kingdom has repeatedly accepted that its writ does not run contrary to the expressed will of national communities. Whether the United Kingdom would have been so desirous to close the ‘fairness’ question and move to the substantive debate had the long term polling not been so strongly in its favour, or if Scotland represented a larger share of GDP than c.10% is far from clear. A pragmatic assessment that a ‘loss’ on allowing the referendum would be more than compensated by a likely ‘win’ in the actual vote very likely contributed to the United Kingdom’s flexibility on these issues. 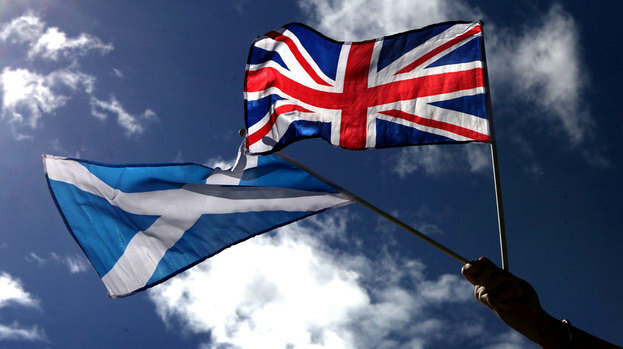 More prosaically, there is a keen awareness on both sides that whatever the outcome of any referendum, Scotland and the United Kingdom will continue to share the closest possible ties – economic, social, trading and others – and that friendly relations would be in everyone’s best interests. Above all perhaps, there was a genuine, shared, desire by both governments to craft a process that was roundly accepted as legitimate and as such would result in an outcome that generated losers’ consent, whoever that might be. For a fine conspectus, see Michael Keating, The Independence of Scotland: Self-Government and the Shifting Politics of Union (OUP Oxford 2009). Clearly this proposition, or dogma, depending on one’s view, is challenged by the competing claims to supremacy of European Union law, human rights law, and indeed the democratic mandates of the UK’s own subnational Parliaments and assemblies. For judicial considerations of these issues, see respectively, R. v Secretary of State for Transport, ex parte Factotame (No.2)  1 AC 603, Jackson v Attorney General  UKHL 56, and AXA General Insurance Ltd & Ors v Lord Advocate & Ors (Scotland)  UKSC 46. < http://www.legislation.gov.uk/ukpga/1998/46/contents> accessed on 2 July 2014. Ibid at Schedule V Part I – these are the broadly framed ‘general reservations’. Part II further lists a number of ‘specific reservations’ including trade and industry, energy, social security etc. Scotland Act, s31(1) – a Minister in charge of a Bill must state whether, in their view, the Bill’s provisions are competent. Scotland Act, s31(2) – the Presiding Officer must state whether, in their view, the Bill’s provisions are competent. Scotland Act, s32-34 – after the passing of a Bill and before Royal Assent, the Law Officers may refer a Bill to the UK Supreme Court if they suspect that its provisions are incompetent. If the Supreme Court agrees, the Bill must be amended in order to proceed. See generally, Chris Himsworth and Christine O’Neill, Scotland’s Constitution Law and Practice (2nd edn, Bloomsbury Professional 2009) 226-237. Although elections to Westminster operate on a pure plurality (‘First Past the Post’) basis, all other UK elections (those for the European Parliament, national assemblies of Wales and Northern Ireland, local government and Mayors) adopt a variant of proportional systems. 1999 – Labour/Liberal Democrat coalition; 2003 – Labour/Liberal Democrat coalition; 2007 – Scottish National Party minority government. < http://www.parliament.uk/briefing-papers/lln-2014-021/polling-data-on-the-scottish-independence-referendum > accessed on 27 June 2014. “A Scottish Government Working For Scotland”, <http://votesnp.com/campaigns/SNP_Manifesto_2011_lowRes.pdf> accessed on 2 July 2014. See generally, Karin Gilland Lutz and Simon Hug (eds), Financing Referendum Campaigns (Palgrave Macmillan 2009). Martin Loughlin, The British Constitution: A Very Brief Introduction (Oxford University Press 2013), citing James Thomson’s poem of 1736, “Liberty”. For perspectives from the Labour left, Liberal centre and Conservative right, see respectively Will Hutton, The State We’re In (Cape 1995); David Marquand, The Unprincipled Society: New Demands and Old Politics (Fontana 1988); Lord Hailsham, The Dilemma of Democracy: Diagnosis and Prescription (Collins 1978). Navraj Singh Ghaleigh, ‘Sledgehammers and Nuts? Regulating Referendums in the United Kingdom’ in Karin Gilland Lutz and Simon Hug (eds), Financing Referendum Campaigns (Palgrave Macmillan 2009). See generally Stephen Tierney, Constitutional Referendums: The Theory and Practice of Republican Deliberation (First Edition, OUP Oxford 2012). <http://www.scotland.gov.uk/Publications/2012/01/1006/0> accessed on 2 July 2014. It should be noted that unlike other jurisdictions, the UK does not have a generic referendum act that can be used to initiate a referendum poll. Rather, each individual referendum relies on a dedicated Act of Parliament for its legal basis – Ghaleigh, ‘Sledgehammers and Nuts? Regulating Referendums in the United Kingdom’ (n 17). Gavin Anderson et al: “The Independence Referendum, Legality and the Contested Constitution: Widening the Debate”, available at <http://ukconstitutionallaw.org/tag/scotland/page/2/>, accessed on 2 July 2014. Available at <http://www.scotland.gov.uk/About/Government/concordats/Referendum-on-independence> accessed on 2 July 2014. See Scotland Act 1998 (Modification of Schedule 5) Order 2013, SSI 2013/242, para 3 – devolving to the Scottish Parliament the competence to legislative for an independence referendum, to be held by the end of 2014.